The Israeli army is to deploy remote-controlled bulldozers to demolish Palestinian buildings. Officials say the towering D-9 bulldozer has been modified to eliminate the risk to drivers. 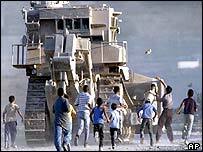 The original US-made vehicle has been used to demolish hundreds of buildings linked to Palestinian militants in the West Bank and the Gaza Strip. Palestinians say the new version will mean more buildings will be destroyed - and more lives will be lost. Standing as high as a small house, the armour-plated bulldozer has been used to knock down buildings, flatten olive groves and clear paths for advancing soldiers. Protected by army back-up, the D-9 is controlled by a driver in a cab who has to operate on the frontlines in some of the most hostile areas. The Israeli army said the modified versions will save lives. "Today the bulldozer drivers are exposed to great danger when they knock down buildings that have militants hiding in them," Israel's Technion Institute of Technology, which developed the robot version, quoted an unnamed army officer as saying. The D-9 gained notoriety when it demolished dozens of buildings in the Palestinian city of Jenin during one of the fiercest battles of the conflict, in April 2002. An American pro-Palestinian activist, Rachel Corrie, was crushed to death by a bulldozer while trying to stop a house demolition in Gaza in March. Palestinians have denounced the development, saying it will lead to greater loss of life. "The whole idea is despicable," said chief Palestinian negotiator Saeb Erekat. "If an unmanned bulldozer is used, human life is in much greater danger." The human rights group Amnesty International has said house demolitions violate international law. Israel says demolitions are necessary to prevent militants using buildings for cover and to deter attacks by Palestinian suicide bombers. The new bulldozers are expected to go into service in the next few weeks.